Whether you’re out trick-or-treating on Halloween, marvelling at the fireworks on Bonfire Night, or simply in need of a classic winter coat, look no further than this stunning selection from Farah and Guide London. We’ve picked out four for your consideration, each displaying our Great British Heritage in all its glory – from the Royal Navy to Only Fools and Horses. A high-quality coat isn’t just another piece of clothing, it’s a ten year investment. That’s why it’s vital to find the right garment for you. 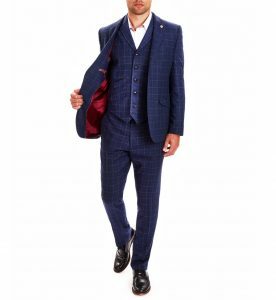 Here at Apache, we’ve spent 23 years sourcing the best coats and blazers from some of Britain’s most prestigious menswear brands, and our vast experience and knowledge is hopefully shown by our carefully curated selection. You can claim a 10% discount on all jackets, coats and blazers with our special offer code COATAW16! Just type it in at the checkout, or mention the offer in-store. Here at Apache, there are certain garments that sell out year in, year out. Farah’s Myton Pea Coat is one of these select few, and it’s easy to see why: it combines supreme warmth, durability and style in equal measure. These days the Pea Coat is a staple in winter menswear, but its heritage dates back to the 19th Century, when it was first sported by Dutch sailors (indeed, the name comes from the Dutch word “pije“, meaning a wool coat.) 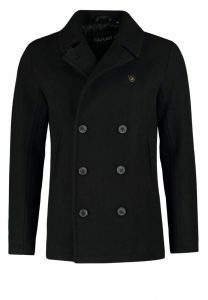 The Pea Coat was further popularised by the all-conquering British Navy, who found that it offered unbeatable protection from the elements on the high seas. Farah’s modern version remains true to the original double breasted style, but with contemporary twists such as Farah Vintage logo buttons and an onion quilted interior lining. The oversized collar and top button keep out the winter chill, and the durable wool Melton fabric has a surprisingly soft handle. In our estimation, nothing beats the Myton Peacoat for keeping you warm and dry this winter – and indeed for many winters to come. Another eye-catching arrival from Farah is this fantastic Askern Overcoat. The Crombie style is instantly recognisable and remains an enduring classic, worn by such luminaries as Sir Winston Churchill, the Beatles, and – of course – Del Boy! Farah’s latest interpretation comes dripping in heritage, and boasts a gorgeous Camel colour. 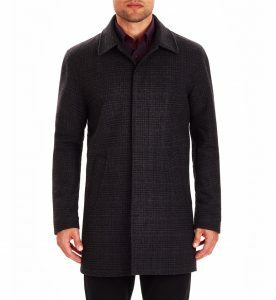 It has a regular fitting to allow for undergarments, and offers the trademark warmth, comfort and wearability you’d expect from a high-quality coat. 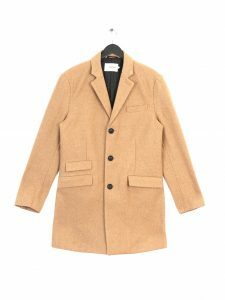 The Farah Askern Overcoat is single breasted and has three front buttons with no placket, making it a breeze to get on and off. There’s a chest pocket, single bluff pocket, two lower flap pockets, and an interior pocket, giving you more options than the average coat. The black interior lining features a subtle, self-coloured tonal check pattern. Like the Myton Peacoat, the Askern Overcoat earns rave reviews every year from our treasured clientele. If Camel doesn’t do it for you, it is also available in Black. The success of BBC1’s Peaky Blinders has changed what many people now look for in a winter coat. The hit British drama is famous for the long, dark overcoats worn by 1920s Brummie gangster Thomas Shelby and his partners in crime. While you probably won’t need Shelby’s trademark three-piece herringbone suit to make in impression, this Guide London Check Overcoat is an absolute must-have. The single breasted garment is made from the finest Italian wool, and is remarkably light and warm. The fabric boasts a simple, classic black and charcoal woven check. There are two generous side pockets, and five buttons hidden under the placket. The interior has a tonal paisley lining to create a gorgeous black-on-black effect, adding artful sophistication to this overcoat’s gritty street cred. As you’d expect with Guide London, no detail is overlooked here, however small. This classy blazer jacket is a tailored fit, and has delighted all manner of customers from 38 inches to 46 inches. The fine wool fabric is made in Italy, and is a joy to look at. The highlight of the Royal Windowpane Check blazer is its sensational interior lining, which has to be seen (and felt!) to be believed. The interior sides have an intense maroon lining, and the back features an incredibly detailed pattern of small pentagons, each with a flower-head inside. There are two interior pockets, one with a button, and an interior coin pocket. As for the outside of the blazer, there’s an all over Windowpane Check design in a classic Royal Blue. It also has two distinctive brown “football buttons” and a matching pocket-square. The Camel Windowpane Check blazer is just as desirable. Spoilt for choice? We don’t blame you. Any one of these magnificent items would make a cracking gift for a loved one, not to mention for yourself! Click here and use our great offer code COATAW16 to get 10% off all jackets, coats and blazers at Apache online, or pop down to our store in Horsham!